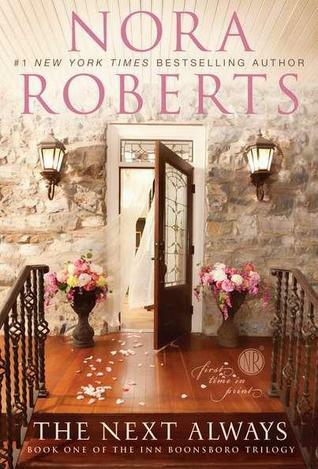 It's been a while since I read a Nora Roberts (I think) and this book didn't really make me regret not picking it up sooner. This came across as a quiet-ish romance, with a slightly OTT stalker plot that felt a bit out of place. I liked the relationship between Beckett and his brothers - one thing Nora Roberts does very well, I think. And Claire's kids were fun, if a little on the overly-sweet side. A bit too much page-time was spent on the inn construction (and in a way, it was weird knowing the inn and the bookstore were real-life places). And unfortunately, the ending (view spoiler)[ with the paranormal elements (hide spoiler)] made me roll my eyes. Sign into Goodreads to see if any of your friends have read The Next Always. The Witness is actually a really good NR standalone. I don't usually go for her suspense stories, but the interaction and the small town life really worked for me. The inn renovation bits and small town brothers getting their various loves she already did better in the 80s with the MacKade Brothers. I've just finished The Witness myself - liked the suspense, but the romance felt a bit rushed to me. If we're talking small-town stories, I loved her Chesapeake Bay books. Yes, those are even better for the brother factor (especially because it is not brother by blood), but I was comparing this series to the Boonsboro Inn books because the MacKade books have an inn being restored and rehabilitated, too - if not as the utmost centre of all four books. My favourite romance with restoring a house book by her is The Tribute, though. I agree with you on this one, Li. Not her best romance (where was the tension? where was the passion?) and too many pages wasted on other issues (construction, etc...) besides the romance. @Hils - Yes! Way too much on the construction side IMO - and I normally don't mind side details. They've been re-released singly with new covers by Harlequin in ebook recently and I just reread them last month, so the knowledge was fresh. I think they stand up well to the test of time, mostly, they were released in the late 80s as one of the Silhouette category romance series she wrote. There's already a little paranormal touch in them with a civil war ghost bit. Estara wrote: "They've been re-released singly with new covers by Harlequin in ebook recently and I just reread them last month, so the knowledge was fresh. I think they stand up well to the test of time, mostly,..."
Li, I agree with Estara, the McKade books are much, much better. I also began comparing the two series as soon as I began reading this book. There's a better balance to the McKade series. The romances there are wonderful, and the ghosts make sense! Also, like Estara, I've re-read those books countless times, so yeah... better. LOL! Right - with such glowing recs, I'm going to have to check these out now!